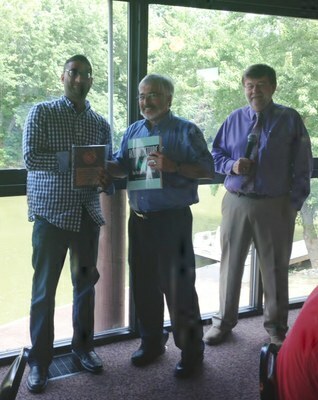 Dr. Pritesh Kumar was honored with the 2014 KC Huang Outstanding Graduate Student Award at the Department of Pharmacology and Toxicology welcome picnic held August 14, 2015. The award is named in honor of Professor KC Huang who served as a distinguished department faculty member from 1953 to 1998. Dr. Kumar received his PhD in pharmacology and toxicology in 2015. His faculty mentor, Professor Zhao-Hui (Joe) Song included in Dr. Kumar's nomination that he had published 7 scientific papers during his dissertation studies, four as first author. He presented his research at many national and international scientific meetings, including selections for oral presentation and receipt of a best graduate student presentation award. Dr. Kumar was very active in a number of activities at UofL, including the LCME accreditation process, and service as a SIGS ambassador, and on the Graduate Student Council. Dr. Kumar is CEO of PhytoSciences Inc., a company developing advanced medicinal cannabis-based therapeutics. Dr. Kumar joins a distinguished group of KC Huang Outstanding Graduate Student Awards.